The Clean Energy Means Business Corporate Summit features expert speakers from the corporate and clean energy sectors from throughout the Mountain West. Workshop presentations and panel discussions throughout the conference are designed to provide actionable insights for corporate leaders. For a full list of our speakers please see the agenda page. Eliot has over 12 years of experience in the renewable energy industry, having worked in business development roles at a UK-based solar startup, GE’s global Renewable Energy business, and San Diego-based Renovate America. Eliot currently leads Namasté Solar’s commercial sales team, working with strategic partners to develop C&I and EPC projects in target markets throughout the U.S. Prior to joining Namasté Solar, Eliot was the Founder and Principal of Abel Clean Energy Advisors, a consulting firm that helps commercial property owners and developers utilize innovative financing to implement renewable energy and energy efficiency solutions that increase value, reduce operating costs, and enhance the sustainability of their properties. Eliot holds a BA from Stanford University and an MBA from the Yale School of Management. 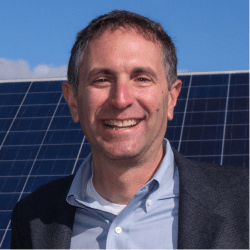 Eric Blank is currently President of Community Energy, Inc. He is also a lawyer and economist who has worked on electric utility and clean energy issues for more than thirty years, developing and bringing online over 1,500 MW ($3 Billion) of wind and solar energy projects. Eric spent ten years during the 1990s running the energy work for Western Resource Advocates (WRA), a Colorado-based non-profit group that established regulatory and other policies to make it economically feasible for electric utilities in the inter-mountain west to promote clean energy technologies. In 1999, Eric left WRA to co-found Community Energy, a renewable energy marketing and development company, helping to grow it into a profitable 40-person business that was successfully sold in 2006 to Iberdrola Renewables, the largest owner and operator of wind energy facilities in the world. While at Iberdrola, Eric served as an executive vice president leading US wind development, placing over 700 MW of new wind facilities into commercial operation over a three-year period. In 2009, Eric and his business partners re-purchased Community Energy and are now focusing on utility-scale solar PV development. Since 2009, Community Energy has developed and built roughly 800 MW of solar PV, including the largest operating solar projects in the Mid-Atlantic, Midwest, and Intermountain West regions. Eric holds a Master’s degree in economics from the London School of Economics and a J.D. from Yale Law School. John provides commercial PACE funding for Petros PACE Finance for renewable and energy efficient building improvements and is also faculty at Ecotech Institute, the only dedicated renewable energy college in the US. 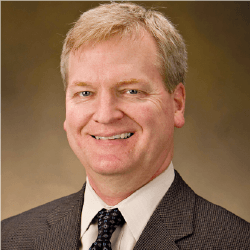 He is heavily involved in state renewable energy policy having been on the Board of COSEIA for 7 years, 2 as president, and as expert witness in several PUC proceedings. John is lead co-author of “PACE Yourself” the first book on the topic of PACE financing due out before end of 2018. He also serves as Board VP for New Energy Colorado, (NECO). In 2018, John provided consulting to Google X (aka The Moonshot Factory) on energy and DER market developments. 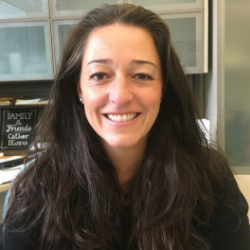 Celeste Cizik is a Principal and Team Leader at Group14 Engineering overseeing Existing Building and Monitoring Based Commissioning Services. She has over fifteen years of experience in building energy engineering including retro-commissioning, energy audits, and mechanical system design. She has assessed millions of square feet of building area around the country including projects pursuing C-PACE financing. CHRIS DIAZ is a principal with Seminole Financial Services, LLC (SFS) a full-service national investment management / financial services organization. Mr. Diaz is responsible for the identification, evaluation, and negotiation of renewable energy finance transactions focusing on solar and wind projects between $2 million and $40 million in need of construction financing; permanent debt financing; and tax credit equity. To date Chris has closed over $1 Billion in Construction and Permanent Financing and tax credit equity for solar and wind transactions. Seminole Financial Services (SFS) provides construction financing; permanent debt financing; and tax credit equity for Renewable Energy Transactions as well as investment management services to various real estate investment vehicles. Currently, SFS manages over $300 million in commercial real estate and renewable energy assets nationwide, for the benefit of various public employee pension and retirement plans. Chris is a frequent National Speaker at industry conferences regarding Renewable Energy Finance and Energy Credits. He has published multiple articles regarding Renewable Energy Finance. Chris is on the Board of Directors for the Solar Energy Industry Association (SEIA), is a board member for the Solar Energy Trade Show (“SETS”) Board of Managers, is a member of SETS Board of Managers Finance Committee, and was Vice-President of the Board of Directors for the Distributed Wind Energy Association (DWEA). Mr. Diaz has been involved with tax credits and financial services for over twenty years previously with Credit Suisse, MMA Financial, and the Midland Companies. He holds a Bachelor’s Degree in Social Science with emphasis in urban and regional planning from Florida State University and an MBA from Nova Southeastern University. Alex Drake is the Direction of Origination for Cypress Creek Renewables. Alex leads site origination and power purchase agreement origination across the Western U.S., with a focus on CO, NV, and OR. Since starting with CCR, he’s signed 115MWac of solar PPAs and 25MW of battery storage capacity agreements. Prior to CCR, he was with SunEdison’s Commercial Solar team and Wilson Sonsini Goodrich & Rosati’s Renewable Energy Government Affairs team. As Director of Corporate Services, Craig leads the Sustainability Department at Aurora Organic Dairy. From setting CSR goals, to leading initiatives to reduce GHG emissions, energy use, water and waste, Craig and his team help drive the company’s commitments to animals, people and the planet. With recent solar installations at two of the company’s Colorado dairy farms, Aurora Organic Dairy has taken initial steps toward implementation of a robust clean energy strategy, learning key lessons along the way. Based in Boulder, Colorado, Aurora Organic Dairy is the leading producer and processor of store-brand organic dairy products for U.S. retailers. Integrated from cow-to-carton, the company owns and operates organic dairy farms in Colorado and Texas, and processes milk at its state-of-the-art milk plant in Platteville, Colorado. Aurora Organic Dairy will open a second milk processing plant in Columbia, Missouri in early-2019. 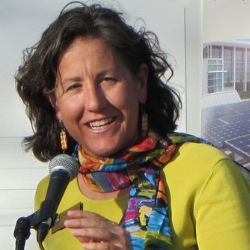 Linda Kogan is the Sustainability Director for the University of Colorado Colorado Springs (UCCS). She received a Bachelor of Business Administration degree from University of Wisconsin Madison, and a graduate degree in Geography and Environmental Studies at UCCS. Linda helped to create her position and developed the office in 2005. In her tenure, and through completion of two comprehensive sustainability strategic plans, the university has achieved a national ranking as an overall top performer for sustainability (2018). Additionally, Linda manages energy performance funds, develops conservation campaigns, advocates for high performance buildings in new construction, and directs the recycling and waste program. She has led numerous renewable energy projects on campus that include solar thermal, on-site photovoltaic, participation in community solar gardens, and the purchase of Renewable Energy Credits. UCCS is an original signatory to the American University and College Presidents’ Climate Commitment, which includes future goals of carbon neutrality. Scott Morrissey is the Senior Director of Sustainability at Denver International Airport, fifth-busiest airport in the United States with more than 61 million passengers in 2017. In this role, he is responsible for developing and improving systems that support the cost-effective achievement of DEN’s sustainability goals through strategic management of the Environmental, Energy, Asset Management, and Noise teams. He previously served as the Operations and Programs Director for the State of Colorado’s Energy Office, as Deputy Director of Greenprint Denver, a comprehensive environmental sustainability initiative housed in the Mayor’s Office, and as a financial management analyst in Denver’s Finance Department. Scott attended the University of North Carolina at Chapel Hill, where he earned BA and Master of Public Administration degrees. Living in Summit County, CO and working at A-Basin for the past 9 years, Mike oversees all of the sustainability initiatives at Arapahoe Basin Ski Area. These initiatives include waste reduction, watershed and ecosystems stewardship, environmental education, and renewable energy and energy efficiency at the ski area. He also oversees A-Basin’s outreach and advocacy programs around sustainability, social and environmental issues. When not at work, Mike is an avid backcountry snowboarder, backpacker, musician and Boston Celtics fan! Erin oversees the work of WRA’s Clean Energy Program in both Colorado and Nevada, with a particular focus on representing WRA in state regulatory proceedings and civil litigation. Erin assists in developing, implementing, and defending state-level policies that reduce the detrimental environmental impacts of the power sector. Erin’s current work is focused on advancing energy efficiency, decarbonizing electricity production, and advancing electrification of other energy uses, such as transportation. Prior to joining WRA in 2013, Erin served as an Assistant Solicitor General in the Colorado Attorney General’s Office. In that capacity, she represented state agencies such as the Colorado Public Utilities Commission, the Colorado Air Pollution Control Division, and the Colorado Energy Office. She also served as a clerk to Justice Alex Martinez of the Colorado Supreme Court. Erin received a J.D. from the American University Washington College of Law and holds a B.A. in both Economics and Anthropology from the University of Colorado. Murphy Robinson serves as the Executive Director of the General Services Department for the City and County of Denver. He is responsible for the property management and maintenance of over 6 million square feet of building space in over 140 facilities and overseeing the purchasing and procurement division, which purchases over 600 million dollars of goods and services a year. Additionally, Murphy directs the Citywide Contracts Office, the City Security Office and serves as a cabinet member to the Denver Mayor. Murphy’s past roles include Chief of Staff and Deputy City Manager for the City of Englewood, as well as, Assistant City Manager of General Services for the City of Brighton. Murphy also served as the founder and president of Robinson Corporations, a successful security and executive protection firm in Cincinnati, Ohio. A Denver native, Murphy enjoys spending time with his wife and daughter and is active in multiple community organizations including the Colorado Rangers and the I Love You Guys Foundation. He sits on the Board of Equalization, the Board of County Commissioners for the City of Denver and the Visit Denver Board. Kent Singer is the Executive Director of the Colorado Rural Electric Association. CREA is a statewide trade association that provides government relations, safety training, education, and communications services to all of Colorado’s electric cooperatives. Prior to becoming CREA’s Executive Director, Kent was the association’s general counsel. Kent has also served as corporate counsel for Tri-State Generation & Transmission Association and general counsel for Holy Cross Energy. Kent began his legal career as a staff attorney for the Colorado legislature. Kent holds a bachelor’s degree in political science from Kansas State University and a law degree from the University of Kansas. Jacob Smith is the executive director of Colorado Communities for Climate Change, a coalition of local governments advocating for stronger state and federal climate policy. Through his consulting firm Cedar Creek Strategies, Jacob also helps advocacy groups in Colorado and across the country do more effective work on environmental and social justice issues. He is a former energy and climate policy staffer for Senator Bernie Sanders and previously served as the mayor of Golden. Shelby is a senior planner with Brendle Group with more than 13 years of experience in community planning and sustainable development. She is a seasoned project and program manager for local governments, utilities, universities, and ski industry clients. Her areas of expertise and interest include long-range and strategic planning, indicators and monitoring systems, climate resiliency, land use planning, and group facilitation. Shelby’s professional background includes roles in community outreach, development review project management, and comprehensive planning. She is currently working on a Master of Public Administration degree at the University of Colorado Denver. Kate Swayne Wilson, Director of Sustainability at Vail Resorts, has more than 15 years of experience in climate change mitigation and sustainability strategy. Ms. Wilson is currently leading Vail Resorts’ ‘Commitment to Zero,’ a pledge for zero net emissions, zero waste to landfill, and zero net operating impact on forests and habitat, all by 2030. Prior to this role, Ms. Wilson developed and led the Greenhouse Gas & Sustainability Strategy Practice at The Cadmus Group for 10 years, assisting companies in the development and evaluation of climate strategy, establishing emissions baselines and reduction targets, developing corporate greenhouse gas inventories, calculating emissions associated with demand-side management portfolios, and providing strategic guidance to clients on policy. As Denver’s first Chief Sustainability Officer Jerry Tinianow works to ensure that critical natural and human resources are available and affordable to everyone in Denver, now and tomorrow. His office coordinates achievement of the City’s ambitious 2020 Sustainability Goals. He is also one of two Americans on the 21-member Global Executive Committee of the international organization ICLEI Local Governments for Sustainability. Jerry previously served as a national officer of both the Sierra Club and the National Audubon Society, and directed the Center for Energy and Environment at the Mid-Ohio Regional Planning Commission. The Sierra Club designated him a national “Environmental Hero” during its centennial celebration. Prior to his sustainability career Jerry was a partner and commercial trial attorney with two of Ohio’s largest law firms. Jerry received his undergraduate and law degrees from George Washington University. At GW he was elected to Phi Beta Kappa, represented the university as a state finalist in the Rhodes Scholarship competition, and served on the law review. He was recently named as the 2018 winner of the Wirth Chair Sustainability Award given by the University of Colorado. Today, Mark’s practice focuses on representing a broad range of clients from transportation providers to small and large utility customers to developers of renewable energy projects. He has represented clients before the Colorado General Assembly, and in various types of proceedings before Colorado Public Utilities Commission and in district and appellate courts. Heidi started work as CU Boulder’s first Chief Sustainability Officer in June 2017. She returned home to Colorado from Washington, DC where she served as the Director of Public Engagement/External Affairs at the U.S. Department of Energy as an appointee of President Barack Obama. Prior to her federal service in Washington, she served there as Director of National and Regional Outreach for the American Council on Renewable Energy (ACORE) where she was part of the policy team and as a Senior Energy Advisor for the Worldwatch Institute. A 4th generation Coloradan, Heidi served as Colorado’s first gubernatorial climate advisor where she oversaw creation of the state’s first Climate Action Plan. She served as Senior Associate of the Wirth Chair in Sustainability at the Graduate School of Public Affairs of the University of Colorado Denver and as Deputy Director of the Presidential Climate Action Project. She has worked on sustainability issues in the non-profit, public, academic and private sectors as an organizer, writer, researcher, and public speaker for the majority of her professional career. She completed a Chevening Fellowship on Finance and Investment in a Low-Carbon Economy in Edinburgh and London in 2009 and is a graduate of Carleton College. Brody Wilson is IBM's Manager, Global Energy and Environment. In his role, Brody oversees energy management, including procurement of traditional and renewable energy, and energy conservation for IBM's operations globally. He is leading IBMs adoption of numerous next-generation energy management tools to improve the efficiency of its global operations as well as aggressively pursuing opportunities for cost effective renewable energy procurement. Brody has been working in the building energy efficiency data analytics space for over 13 years. He is a registered mechanical Professional Engineer in the state of Colorado and holds two bachelors degrees from Oberlin College & Conservatory, one in Physics the other in Trumpet Performance. Mindy Yajko has joined Recurrent Energy as director of origination and structuring in the western U.S. With over a decade of experience in the power business Mindy holds a diverse skill set of industry, finance and commodity expertise. She joins Recurrent Energy from Holy Cross Energy where she was the senior vice president and CFO. During her time at Holy Cross Energy, she oversaw ongoing operations and the execution of strategic initiatives for the organization. Prior to Holy Cross Energy, Mindy was a director of origination at Xcel Energy where she led a team of three originators covering Xcel Energy’s three jurisdictions. Before joining Xcel Energy, Mindy served as Director of Northeast Origination at NRG Energy, where she optimized, initiated and implemented hedging strategies for the northeast region. This included leading, coordinating, negotiating, and executing structured transactions and short-term power, capacity and ancillary products utilizing over 4,000 MW of NRG’s generating assets in NEPOOL, PJM and NYISO markets. Prior to 2008, Mindy worked at J. Aron & Company, the commodity sales and trading arm of Goldman Sachs as a vice president. She holds an MBA in International Management with a global finance specialization from Arizona State’s Thunderbird School of Global Management. She earned her bachelor’s degree in business administration from the University of Colorado.